Annotation: Helping children prepare for Kindergarten by building important motor skills! Big Skills for Little Hands: I Can Cut! will help children build hand strength and dexterity by teaching them to use scissors to cut lines, curves, and shapes. Children will create puppets, play games, and make puzzles while learning an essential skill for school success! A write and wipe board in the back of the book offers more opportunities for learning. 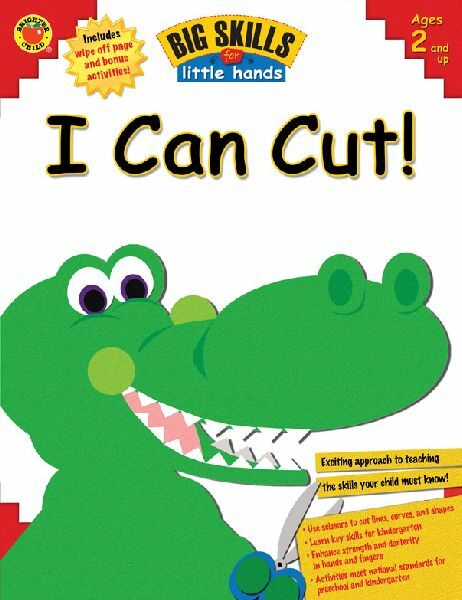 After completing this book, young learners will be proud to say "I Can Cut!" Features: *Cutting activities to create puppets, play games, and puzzles *Activities support national standards for early childhood *Essential practice in manual coordination *A write and wipe board with bonus fine motor activities The Big Skills for Little Hands series features fun activity pages that teach important motor skills necessary for Kindergarten. Children will have fun cutting, pasting, folding, drawing, tracing, and coloring their way to school success! Plus each activity completed becomes a new creation to play with again and again! All the activities meet national standards for preschool and kindergarten. Collect all 8 titles in this must have series!